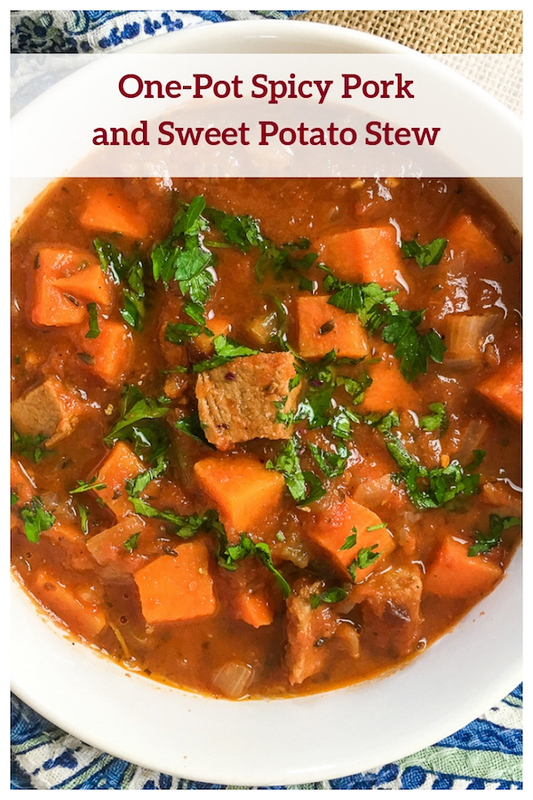 Flavorful One-Pot Spicy Pork and Sweet Potato Stew tastes like it’s slow cooked all day long but goes from start to finish in under an hour. 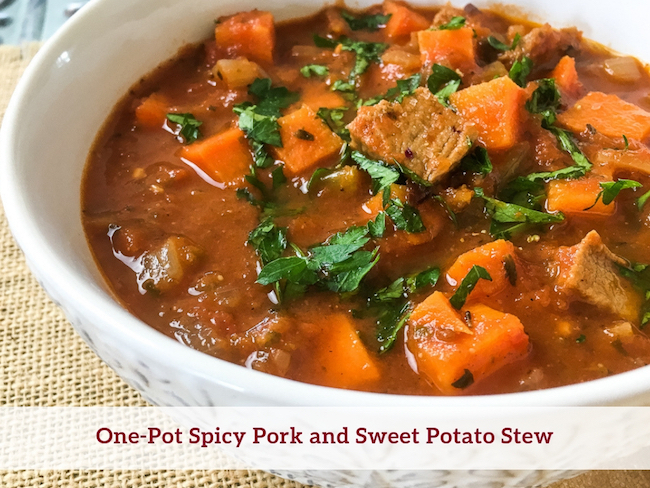 You’re going to love this delicious stew with its unique blend of pork, sweet potatoes, and a medley of spices. Unlike tougher cuts of pork, tenderloin can be cooked relatively quickly. That means you don’t have to let it simmer for hours to get melt-in-your-mouth results. 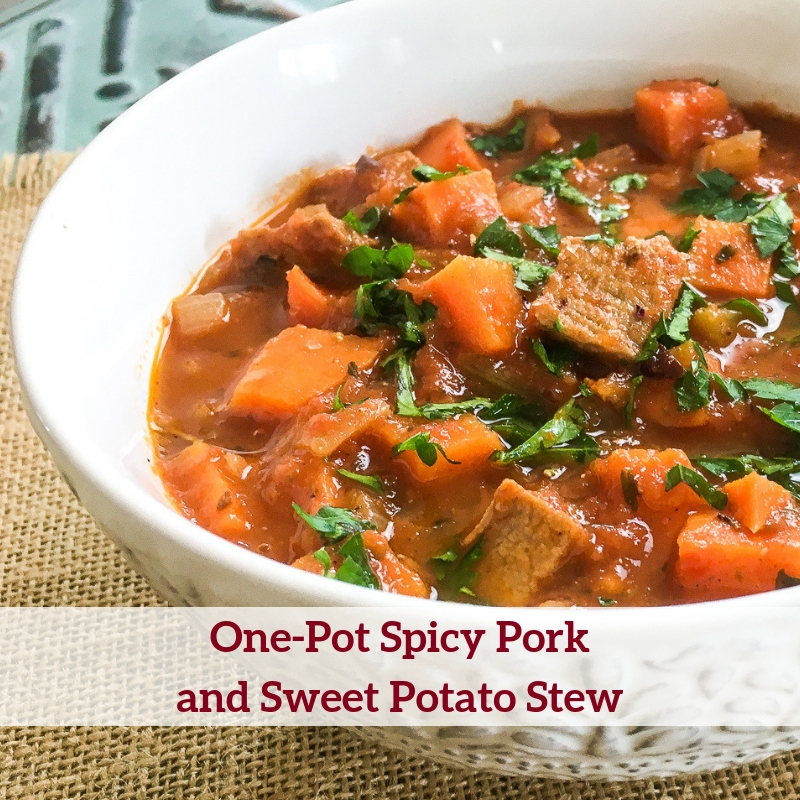 Like most tomato-based dishes, this flavorful stew tastes even better the next day – so consider making a double batch to enjoy later! Heat the olive oil in a large pot or Dutch oven over medium-high heat. Add the red onion, celery, and garlic to the pot. Season with salt and black pepper, to taste, and stir to combine. 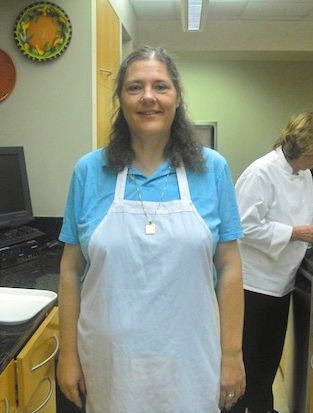 Cook, stirring frequently, until the veggies soften and develop a bit of color, approximately 3-4 minutes. Add the pork tenderloin and sweet potatoes and cook, stirring occasionally, until the meat begins to brown, around 2-3 minutes. Add the black beans and spices and stir to combine. Cook for another 30 seconds, or just until the spices become fragrant. Taste and season with additional salt and black pepper, if desired. Add the crushed tomatoes and chicken stock and increase heat to high. Bring the mixture to a boil, and then reduce heat to medium. Simmer, stirring occasionally, until pork is cooked through and the sweet potatoes are fork-tender, approximately 13-15 minutes. Remove from heat and discard the bay leaves. Stir in 3 tablespoons of fresh parsley. Taste and adjust seasonings, as desired. Top with remaining fresh parsley for garnish and serve immediately. Heat the olive oil in a large pot or Dutch oven over medium-high heat. Add the red onion, celery, and garlic to the pot. Season with salt and black pepper, to taste, and stir to combine. Cook, stirring frequently, until the veggies soften and develop a bit of color, approximately 3-4 minutes. Add the pork tenderloin and sweet potatoes and cook, stirring occasionally, until the meat begins to brown, around 2-3 minutes. Add the black beans and spices and stir to combine. Cook for another 30 seconds, or just until the spices become fragrant. Taste and season with additional salt and black pepper, if desired. Add the crushed tomatoes and chicken stock and increase heat to high. Bring the mixture to a boil, and then reduce heat to medium. Simmer, stirring occasionally, until pork is cooked through and the sweet potatoes are fork-tender, approximately 13-15 minutes. Remove from heat and discard the bay leaves. Stir in 3 tablespoons of fresh parsley. Taste and adjust seasonings, as desired. Top with remaining fresh parsley for garnish and serve immediately. Enjoy!